AMD’s market and financial data give three clues why there will be a better 2H 2019. AMD stock price jumped despite unfavorable Q1 and Q2 revenue estimates but with an upward revision on the Q3 revenue estimate, ignoring the present but focusing on the future. AMD stock rallied amid subsequent simultaneous upward revisions of Q1, Q2, and Q3 revenue estimates. This is a classic Dow’s Confirmation Theory, signaling a reversal in sight. A declining finished goods and work in progress inventory and a rising raw material inventory suggest that both product market and management forecast improve into 2H 2019. Aside from a different issue whether the positive outlook has been baked into stock prices, we are confident that a better 2H 2019 is real for AMD. Tech QQQ ETF has surged more than 25% from the low in late 2018. Specifically, shares of Advanced Micro Devices (AMD) jumped 68% over the same time period. 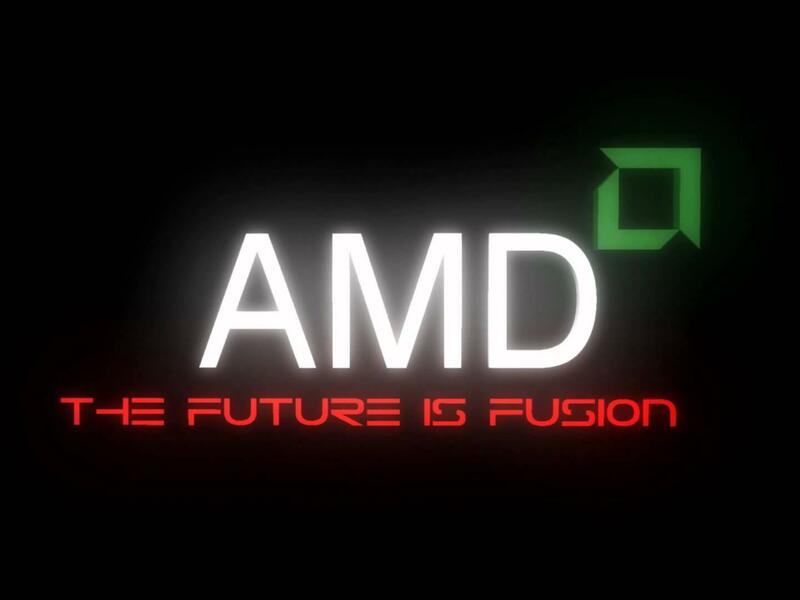 This is due to the expected launch of AMD's new chip for servers, Rome, which will start shipping midyear. CEO Dr. Lisa Su said, "We would expect to ramp through the year (2019). So, starting midyear and then ramp through the back half of the year." However, while there has been little evidence of real improvement in all tech firms' recent fundamentals, many have credited the market rebound to the widespread expectation of a better 2H 2019. This is the reason we asked an obvious question, "Is 2H 2019 recovery real?" In this post, we identified three clues from the stock price, revenue estimates, and inventory structure to verify if AMD's better 2H 2019 is real. The first clue of a recovering 2H 2019 for AMD is at Point A, where AMD stock price jumped despite the downward revision of Q1 and Q2 revenue estimates but with a mild upward revision on the Q3 revenue estimate (Figure 1). As shown in a previous post, this divergence between stock price and earnings announcement appears to suggest that AMD may have been capitulated. This is the time when old investors gave up and cashed out while new bottom buyers disregard the recent negative financials but focus more on distant positive forward financials, i.e., 2H 2019. The second clue is more of a confirmation of the above conjecture at Point A. At Point B (late March), AMD rallied amid simultaneous upward revisions of Q1, Q2, and Q3 revenue estimates. At this time, there appears little doubt on investors' mind to start pricing in an improved second half of 2019. In the tech world, long term is anything over one quarter. Starting 2H 2019, AMD's Ryzen and EPYC chips continue to be the key drivers in fueling the company's sales growth. The 1Q guidance, albeit 15% below analysts' estimate, may still best Nvidia's (NVDA) 1Q outlook. The single-digit growth in data center CPUs and GPUs remains the near-term bright spot, though it is too soon to call the final split of future market share among AMD's 7nm, Intel 10nm, and Nvidia's Turing. AMD's strategy of regaining CPU market share through lower-end server CPUs seems to be paying off at the expense of a structurally lower margin than Nvidia and Intel (INTC). However, invading into Intel's dominated high-end corporate IT server space is allowing AMD to expand its margin in the low 40%s by early 2020. The last clue, often mentioned, but rarely documented is the overhanging inventory that seems to put a ceiling on AMD's price. Overhang GPU inventory in the channel and slow Game Consoles sales, mainly a backdrop from the depressed crypto activities as well as China slowdown, linger into 1H 2019. On the server side, the new challenge, also the new opportunity for market share is that while higher corporate IT spending raised server demand in 2018, it looks to slow down in 2019. 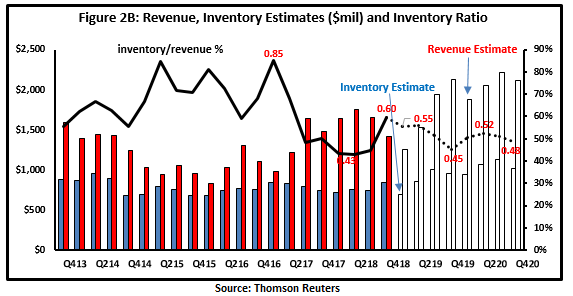 Therefore, AMD total inventory is estimated to first dip in Q1 2019 just shy of $700 million and rise over $1 billion starting Q3 2019, mainly reflecting an improved revenue outlook in 2H 2019 (Figure 2A). As inventory may be affected by the changes in revenue, a historical average 60% inventory to revenue ratio has been hit Q4 2018, while over 80% inventory ratio in 2017-2018 reflected the overhanging channel inventory due to the depressed crypto uses (Figure 2B). Yet, a better 2H 2019 revenue outlook along with a clearance of channel inventory will bring the inventory ratio below 50% starting 2H 2019. Other than we rarely look into the actual inventory over time, the changing structure of the inventory provides more interesting implications in terms of outlook of the product demand. 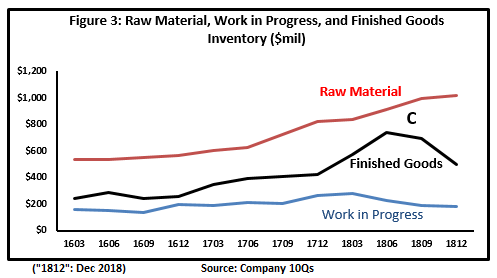 In terms of inventory structure, we were able to demonstrate the breakdown of AMD inventory among raw materials, work in progress, and finished goods over time (Figure 3). It is very revealing that while AMD's raw material inventory continues to build up, both work in progress and finished goods inventory started to decline in late 2018. Incidentally, the decline of AMD finished goods inventory coincides with the timing of the crypto collapse. Furthermore, we are trying to read more into the different trending of the three types of inventory. A declining finished goods inventory is always the first sign to signal a recovery, which is followed by a lower work in progress inventory. A simultaneous rising raw material inventory confirms the positive demand outlook as the company will order more raw material amid their favorable short-term forecast. The three inventory movements suggest that both product market and management forecast improve into 2H 2019. Street analysts and the stock price have been very optimistic about AMD's long-term fundamentals, and there are more and more signs indicating China's uncertainty, crypto weakness, and the Fed's tight interest rate policy will become headwinds blown over by 2H 2019. Wall Street's wisdom expects that AMD's Ryzen, EPYC and Rome chips will continue to fuel the sales growth. AMD's strategy of regaining CPU market share through lower-end server CPUs has paid off at the expense of a structurally lower margin than Nvidia and Intel. Invading into Intel's dominated high-end corporate IT server space and data center allows AMD to expand its margin in the low 40%s by early 2020. Even with AMD's 4Q performance "better than feared," investors seemed to shed off the softness in 4Q revenue and the lower 1Q 2019 guidance. The subsequent stock price rally suggests that the market attention has been placed on the longer-term growth in 2H 2019 amid the upward revisions for 1Q, 2Q, and 3Q revenue estimates. AMD's changing inventory structure also shows a better color of 2H 2019. Finished goods and work in progress inventory already declining, along with an increasing raw material inventory, indicates the recovering product demand and the stronger management confidence in the near term. Aside from a separate issue whether the positive outlook has been baked into AMD stock price, we are confident that a better 2H 2019 is real for AMD.